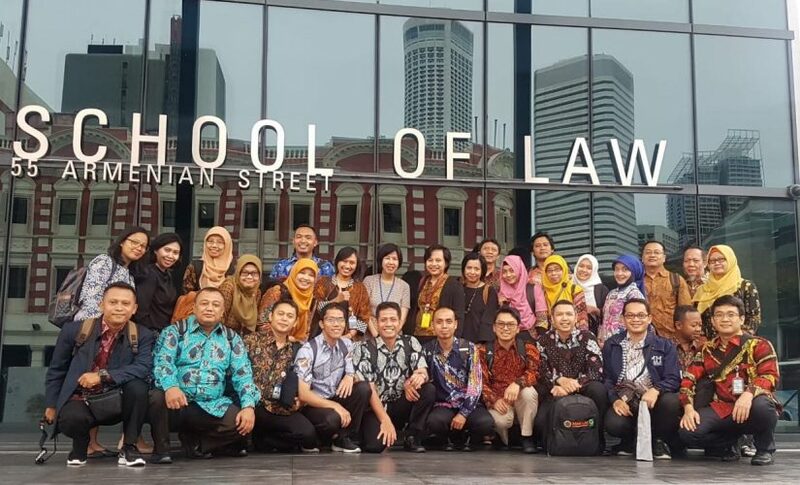 The Faculty of Economics and Business, Gadjah Mada University (FEB UGM) sent 29 delegates to the immersion program held at Singapore Management University (SMU). The activity which was held on November 13-14, 2018 focused on studying business processes in leading academic institutions in Asia. This activity is an active step for FEB UGM to continue to develop into a leading business school institution in Indonesia that contributes significantly to international scope. Located at the SMU School of Law Building, this activity presents discussions among institutions in a variety of managerial activities in the fields of finance, information technology, quality assurance, human resources, cooperation and corporate branding, academics, and student services. Three delegates from the Master of Science and Doctoral Program FEB UGM (MD FEB UGM) were Sutopo Yuwono Sunu, Riana Wijayanti, and Tur Nastiti. The discussion process resulted in various institutional development ideas for the FEB UGM delegation. In the cooperation and corporate branding, Riana Wijayanti learned that a systematic and structured business process is needed from a strategic level to an operational level to demonstrate the contribution of the field of cooperation in MD FEB UGM. Commitment from the leader and the participation of employees as ambassadors of the branding of an institution are essential prerequisites in various activities for managing collaborative activities that are in harmony with the mission and vision. Meanwhile, Sutopo Yuwono Sunu noted that the facilities owned by an educational institution must continue to develop following the dynamic movements of its students who are currently dominated by the millennial generation. Besides, attention to environmental sustainability must be considered in line with the development of various facilities. In the field of human resource management, this forum noted that the best talents from teachers and practitioners in the managerial field of educational institutions are needed for mature and professional work collaboration processes.